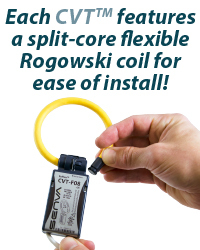 The EM Series is the safest and fastest meter to install on the market.The perfect product for retrofits as the high voltage components are embedded in the Current/Voltage TransducerTM (CVTTM). The entire assembly is easily mounted inside the electrical panel eliminating labor and space required to install a separate transducer box. Each CVTTM sensor uses digital communication with the meter for superior noise immunity--ideal for applications where accuracy matters! The CVTTM sensors are individually calibrated and measurement accuracy is independent of the transducer. 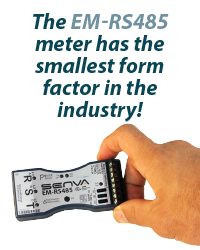 The EM-RS485 is a three channel meter, capable of monitoring single-phase, two-phase and three-phase systems, as well as 3 independent single-phase systems with one meter. The EM-RS485 meter offers BACnet MS/TP and Modbus RTU protocols and 2 pulse inputs to maintain flexibility during installation and operation. 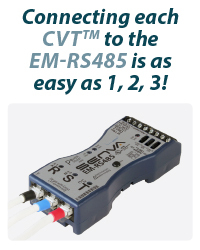 The EM-RS485 is compatible with all sizes of CVTsTM. With the EMRS485 intelligent meter technology, the device self-configures baud rate, serial format, protocol, and address (BACnet only) - eliminating additional configuration steps. 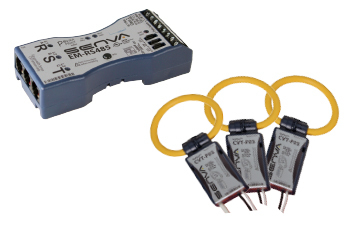 One universal EM-RS485 meter supports all CVTTM sensor options in the family. Integrated rare earth magenets serures the EM-PULSE meter to any ferrous enclosure or surface -- ideal for auditing!